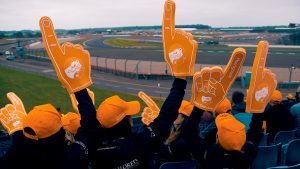 Alex Toth-Jones Racing | Silverstone June 18 Highs Lows and a sea of orange! 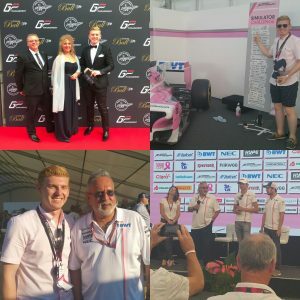 June was a mix of highs and lows on and off the track for me this month. 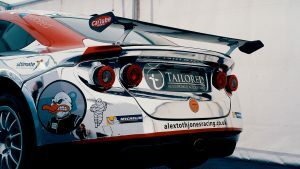 Ginetta GT5 Challenge headed for Silverstone and was teamed up on the grid with another Ginetta series G40 Cup, a field of more than 50 cars took the track on the GP circuit. And because we don’t like to do anything by halves we also had VIP 90 guests in hospitality 4 promo girls 1000 orange Bertgoose hats and 1000 foam fingers to give out! Mechanical issues had hindered me early in the week in testing and Qualifying was tough to qualify p5 considering how much traffic was on the track was really good. Race one however was a real struggle as we were down on power for some reason and while I did the best I could, it was a case of damage limitation and finished 8th. I had to fight really hard to get the result so to be handed a reprimand for contact during the race that has cost me ten championship points was frustrating as I felt it was nothing more than a racing incident. I put that to the back of mind for race two and with the team having fixed the power issue, I drove out of my skin to get into third and made a small mistake that resulted in the track limits penalty putting me back to 5th position. Despite that, I’m happy with how I drove and it’s just unfortunate that a few issues hampered our chances as I feel we had the pace to bring home a top three finish. However, I’m confident that we can be back on the podium at Spa when we head there for the next round 21/22 July. Off the track was another story our VIP guests had a fantastic time, there was a sea of orange hats and foam fingers where ever you looked so a great promo weekend. Now onto Spa Francochamps for the SRO Speed week!